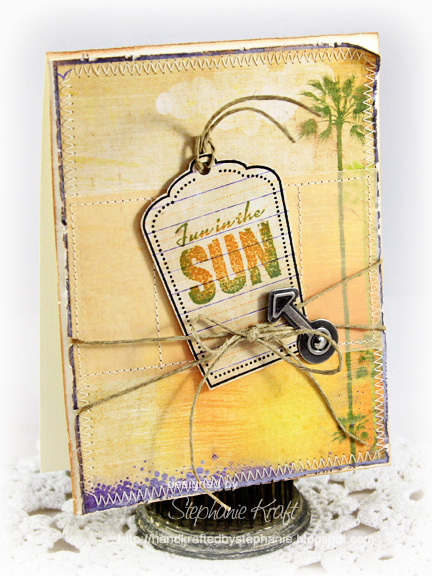 HandKrafted by Stephanie: Viva la Verve -- Fun in the Sun! Viva la Verve -- Fun in the Sun! Hello there! Happy Friday! I hope you've all had a great week.. I've been buried in projects and I now have 10 scheduled posts for next week... EEEKS! As I was getting ready to clean up my craft room, I ran across the newest Viva la Verve sketch and decided to play along just for fun! I used Verve's Relax (which just so happens to be on sale right now) and paired it with some paper from Fancy Pants Beach Bum. I loved the cool beachy scene in the background and didn't want to cover it up, so I just added a sheet of vellum over part of it and added some stitching to mimic the middle panel of the sketch. I stamped the Sweet Scallop Tag directly onto a sheet of lined patterned paper and cut it out with the Sweet Scallop Die. Then I stamped my sentiment by combining Wild Honey and Stormy Sky distress inks (so the yellow + blue made green.. :)). Accessories: Sweet Scallop Die (Verve), Distress tool, Hemp, Arrow brad, Foam tape, Thread, Sewing machine. Wowsers, girlfriend - 10 posts!!!! I'll look forward to them :) This is a great card! Love the background paper & your awesome tag. Have a great weekend! What a great card, Stephanie! Love your take on the sketch!! What a fun summery card. Looking forward to the posts coming! Such a lovely tag! And so perfect for summer!